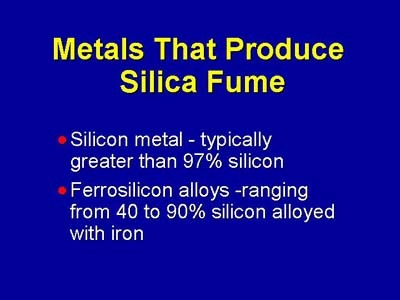 Silica fume from the production of silicon metal and ferrosilicon alloys may be suitable for use in concrete applications. However, silica fume from all of these products may not meet the minimum silicon dioxide requirements of ASTM C 1240. If a particular silica fume does not meet the requirements of ASTM C !240, testing is recommended to determine whether required concrete properties can be achieved. ASTM C 1240, Standard Specification for Silica Fume for Use as a Mineral Admixture in Hydraulic-Cement Concrete, Mortar, and Grout.